This is my brag post. My dearest made me this copper flower for our 7th anniversary in December. Being the hands-on type and knowing that I love using stuff around the house, he melted my heart with this gift. 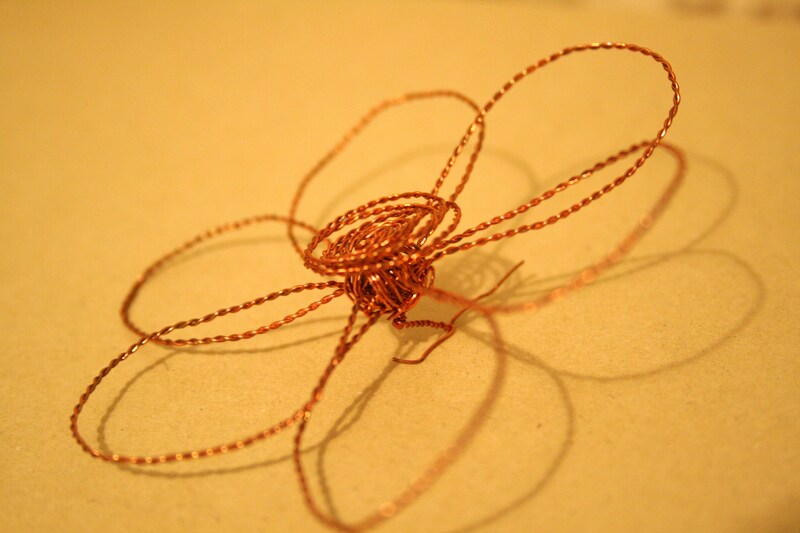 He mentioned that he used copper wire because you’re supposed to give something made of copper on a 7th anniversary (oops), but you can use any wire. The wire in this flower is a very thin gauge copper wire, so he doubled and twisted it (safety wire style if you’re an A&P Mech) and formed the scroll center first. He then made a “stem” to secure the petals to. The flower is one solid piece, so it is fairly sturdy while maintaining its delicate appearance. It measures about 2 1/2 inches in diameter, making it the perfect size to finish into a pin, magnet, hairpiece, or whatever you can think of. Flowers that last forever, how sweet!